Two songs have been receiving heavy rotation on the LIFB stereo recently, and there is a disturbing pattern emerging. Over both 'Some Nights' by New York band fun. and 'Vase' by Sweden's Miike Snow, the legacy of Phil Collins looms large. 'Some Nights' has inspired spirited renditions of 'True Colours' over the top of the whoa-oh-oh bits, and there is something about the treatment of the vocals in 'Vase' that make them sound just like like they are being performed by Collins himself. The idea that 'prog is back' has been around for a while now, powered by a gradual increase in releases of concept albums and the stamp of Gallic cool on a number of prog-ish releases - a Genesis t-shirt popped up in the video for Justice's On'n'On - but nothing has sounded quite like it could have been discovered on a late period Genesis album than these two. Following years of painstakingly sifting through vinyl bargain bins we have become familiar with Collins' face. He is a 75p box regular - our theory is that the people who buy his records aren't actually fans of music, but because buying records is what people do, they buy the blandest stuff they can find, then when they get older they dump him en-masse. Because his face - usually in terrifying close-up - adorns almost all of his solo albums, he's become a guardian of the cheap second hand records. His impassive stare is that of a bouncer, assessing your suitability to buy a scratched Tina Turner best of or A Night At The Opera. Listening to 'Some Nights' and 'Vase' however, we see that his stare is really one of patient contemplation. 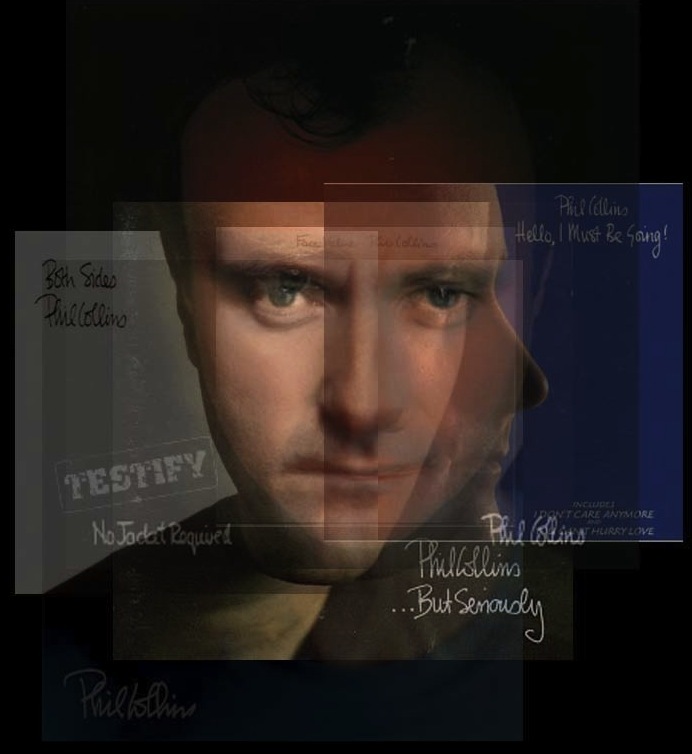 We made a collage of all of his albums this afternoon that you can see at the top of this post, and the power of his compound stare proves conclusively that Phil Collins knew this was going to happen. At this rate we'll be wading in middle-of-the-road prog until the net generation break free from his clutches. Don't say we didn't warn you.